The most used encoding rules are BER (Basic Encoding Rules) and DER (Distinguished Encoding Rules). Both look the same, but the latter is specified to guarantee uniqueness of encoding. This property is quite interesting when speaking about cryptography, hashes, and signatures. ASN.1 provides basic objects: integers, many kinds of strings, floats, booleans, containers, etc. They are grouped in the so-called Universal class. A given protocol can provide other objects which will be grouped in the Context class. For example, SNMP defines PDU_GET or PDU_SET objects. There are also the Application and Private classes. Each of these objects is given a tag that will be used by the encoding rules. Tags from 1 are used for Universal class. 1 is boolean, 2 is an integer, 3 is a bit string, 6 is an OID, 48 is for a sequence. Tags from the Context class begin at 0xa0. When encountering an object tagged by 0xa0, we’ll need to know the context to be able to decode it. For example, in SNMP context, 0xa0 is a PDU_GET object, while in X509 context, it is a container for the certificate version. Scapy provides a way to easily encode or decode ASN.1 and also program those encoders/decoders. It is quite laxer than what an ASN.1 parser should be, and it kind of ignores constraints. It won’t replace neither an ASN.1 parser nor an ASN.1 compiler. Actually, it has been written to be able to encode and decode broken ASN.1. It can handle corrupted encoded strings and can also create those. Note: many of the classes definitions presented here use metaclasses. If you don’t look precisely at the source code and you only rely on my captures, you may think they sometimes exhibit a kind of magic behavior. `` Scapy ASN.1 engine provides classes to link objects and their tags. They inherit from the ASN1_Class. The first one is ASN1_Class_UNIVERSAL, which provide tags for most Universal objects. Each new context (SNMP, X509) will inherit from it and add its own objects. That wasn’t that much difficult. If you think that can’t be that short to implement SNMP encoding/decoding and that I may have cut too much, just look at the complete source code. Scapy enables to create easily network automata. Scapy does not stick to a specific model like Moore or Mealy automata. It provides a flexible way for you to choose your way to go. An automaton in Scapy is deterministic. It has different states. A start state and some end and error states. There are transitions from one state to another. Transitions can be transitions on a specific condition, transitions on the reception of a specific packet or transitions on a timeout. When a transition is taken, one or more actions can be run. An action can be bound to many transitions. Parameters can be passed from states to transitions, and from transitions to states and actions. States are methods decorated by the result of the ATMT.state function. It can take 3 optional parameters, initial, final and error, that, when set to True, indicating that the state is an initial, final or error state. 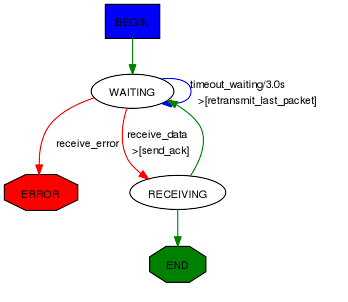 Transitions are methods decorated by the result of one of ATMT.condition, ATMT.receive_condition, ATMT.timeout. They all take as argument the state method they are related to. ATMT.timeout also have a mandatory timeout parameter to provide the timeout value in seconds. ATMT.condition and ATMT.receive_condition have an optional prio parameter so that the order in which conditions are evaluated can be forced. The default priority is 0. Transitions with the same priority level are called in an undetermined order. Actions are methods that are decorated by the return of ATMT.action function. This function takes the transition method it is bound to as first parameter and an optional priority prio as a second parameter. The default priority is 0. An action method can be decorated many times to be bound to many transitions. The parse_args() method is called with arguments given at __init__() and run(). Use that to parametrize the behavior of your automaton. When running, a pipetool engine waits for any available data from the Source, and send it in the Drains linked to it. The data then goes from Drains to Drains until it arrives in a Sink, the final state of this data. there are two canals in a PipeEngine, a lower one and a higher one. Some Sources write on the lower one, some on the higher one and some on both. 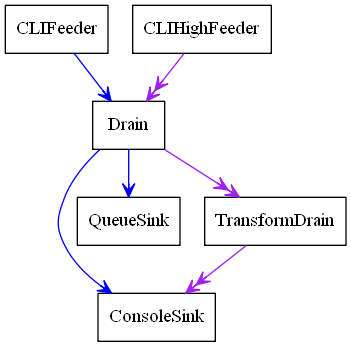 when we send some data in s2 , it goes through the Drain, then the TransformDrain where the data is reversed (see the lambda), before being sent to ConsoleSink only. This explains why we only have the data of the lower sources inside the QueueSink: the higher one has not been linked. For any of those class, have a look at help([theclass]) to get more information or the required parameters. PeriodicSource : Generate messages periodically on the low canal. To send the data back into the next linked Drain / Sink, it must call the self._send(msg) or self._high_send(msg) methods. A Sink is the dead end of data, it won’t be sent anywhere after it. It can be printed into a graph using .graph() methods. see help(do_graph) for the list of available keyword arguments. Now that you know the default PipeTool objects, here are some more advanced ones, based on packet functionalities. Some special sort of Drains exists: the Trigger Drains. Trigger Drains are special drains, that on receiving data not only pass it by but also send a “Trigger” input, that is received and handled by the next triggered drain (if it exists).